The plan for the day was to visit Dwarka town. The first top was Nageshwar Jyotirling. 9:45am We left the hotel after breakfast. The temple was not very crowded and we were in and out in 30 minutes. We started driving back straight away. The temple was probably most peaceful and if you are inclined, you actually get to spend time with the god. Unlike most other jyotirlings you actually get ample time in the sanctum sanctorum. 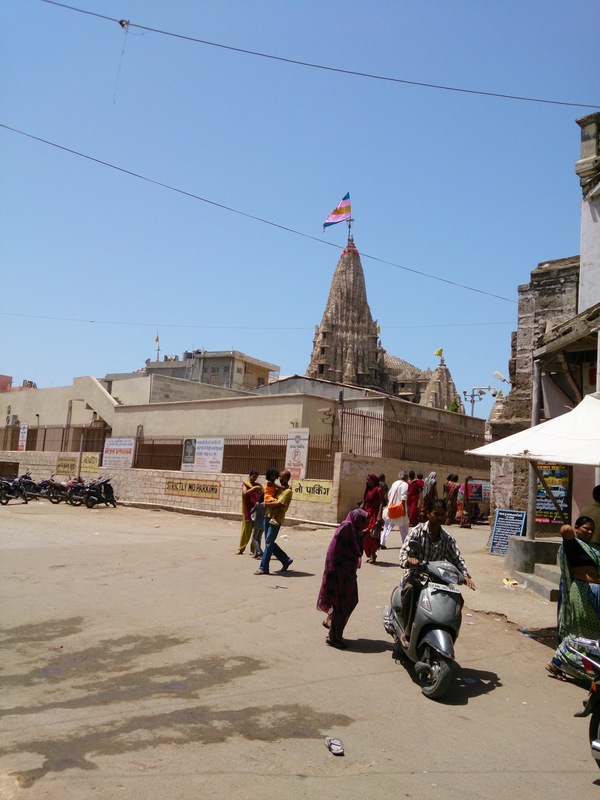 11:20am We reached Dwarkadhish Temple. This temple seemed the most security paranoid about security. They won't even let me take the remote for car lock inside. You can leave other things in your car, but what do you do about car lock remote. You basically need to go to two different set of lockers, one that would contain shoes and another one that would contain other stuff like mobile phones. This place is also full of priests selling their service to you and telling you and the temple is too complicated and you won't be able to reach yourself anywhere. Anyway, I got more a vibe of a good commercial establishment, rather than a place of god. 12:10pm We got out of temple and decided to go back to hotel since it was too hot outside. We decide to spend good part of afternoon in the hotel. 5:30pm We again left towards Dwarka town. The destination was Bhet Dwarka this time. 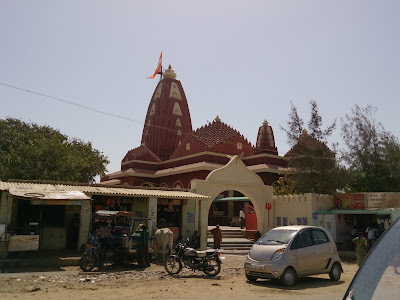 We had to drive right up to Okha Port from where one can get a ferry to go to Bhet Dwarka. The road to Okha Port is actually in shamble currently but work is going on. Actually because of work underway, they have completely scraped the road in all the places so that when the it is newly tarred, it sticks better. You need to continue driving on NH6A or GSH947 to reach Okha Port. The drive to Okha port is very nice. You can see water bodies on both sides of the road which are full of birds. 7pm We arrive at Okha Port. You need to find a ferry that would take you to Bhet Dwarka island. There are ferries that run on regular interval and you can find a seat in one of those. Since we were short on time, we asked one of the boat guy to just take us and he charged us Rs. 1200/- for that. I am sure general ferries cost much much less and we would have opted for that if we had reached here earlier. The ferry ride is around 20 minutes to half an hour. We reached around sunset time so there was a magnificent sunset as we were going towards Bhet Dwarka island. By the time we reached the island, the sun had set and it was dark. The temple closes at 8pm, so we had to be quick to go into the temple. After reaching the port, there is a 15 minutes walk through by lanes to reach the temple. The temple itself was not very crowded. As usual, you have to leave all your belongings outside, so we took turns going inside the temple. We took our ferry back around 8:00pm and were back in port at 8:15pm. We started back towards Dwarka and reached the town by 9:15pm. We decide to have dinner in Aarti Restaurant in the Hotel Damji. It serves typical Gujarati and Marwari meals. Here is my review of the place. We started back 9:30pm and reach our hotel back by 8:55pm.